I think I’m finally getting the hang of writing picture book queries for literary agents, I’m even beginning to enjoy the challenge :-) I’m dealing with the agent queries for the most part, Marie is busy with illustrations (real work). Update: All five literary agent query letters. Query for That Greedy Goat Just Cannot Stay! I started badly, wrote a long winded query to one of the top picture book agents Steven Malk. Result was a quick rejection. We desperately need your help with a matter of great importance. We recently had a problem with our family goat, we were so sure it ate a button from my coat and after it ruined Dad’s new toupee the greedy goat just had to go. We tried to donate the goat to a farm, a petting zoo and in desperation a junk yard, but each time the greedy goat ate something it shouldn’t and we were sent away! Eventually we found the goat a new home, he now works in a boutique and is featured in magazines like Cosmopolitan and Vogue. He’s so famous he’s even met kings and queens! It’s an almost unbelievable story which we need your help to spread to the world. Maybe there are animals in other families with hidden talents like our goat. Every animal should have a chance to find it’s place in the world. With your extensive experience of problem alligators in schools and little fish stealing hats, we know you are the right person for the job. Was trying to be fun and cover the essence of the story. Lots more research about querying and analyzing dozens of agent query letters (there’s loads posted online) and realized they have to be much, much, much shorter and only cover relevant information. Some literary agents receive thousands of unsolicited queries each year, so adding irrelevant details will annoy the heck out of them! In one version I covered that I studied genetics at University (~25 years ago) and planned to work in HIV/AIDs research: we aren’t writing picture books about genetics, HIV/AIDs or even science (maybe one day), so this information isn’t relevant for this pitch, Doh! Many iterations later, we have our current query letter for “That Greedy Goat Just Cannot Stay!”, ready to send to our list of agents who rep picture books. Email Subject – Query : That Greedy Goat Just Cannot Stay! The Addison family’s greedy goat has stolen a button from a coat, ruined Mom’s cherished wedding things and of course munched on Dad’s new toupee. Dad now looks like a funky punk and has had enough, That Greedy Goat Just Cannot Stay! 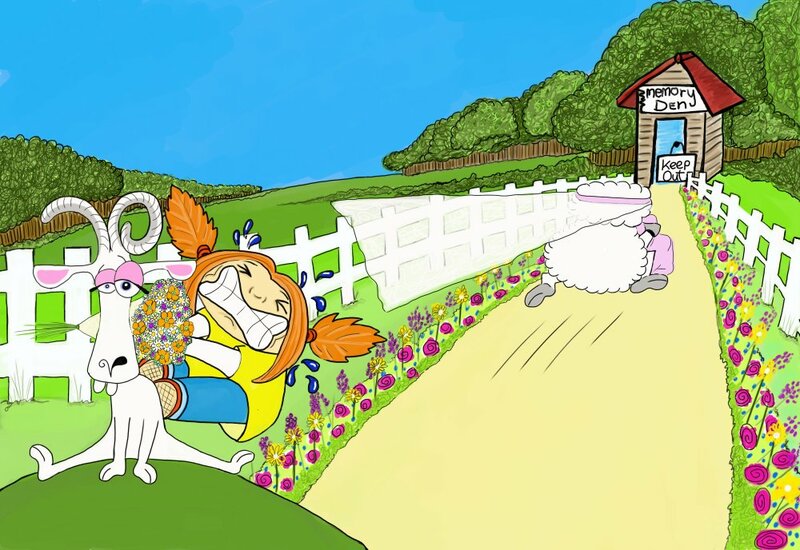 Follow the family’s hilarious adventure as they fail to re-home their greedy goat at a farm, petting zoo, old junk yard and a garden with a moat. 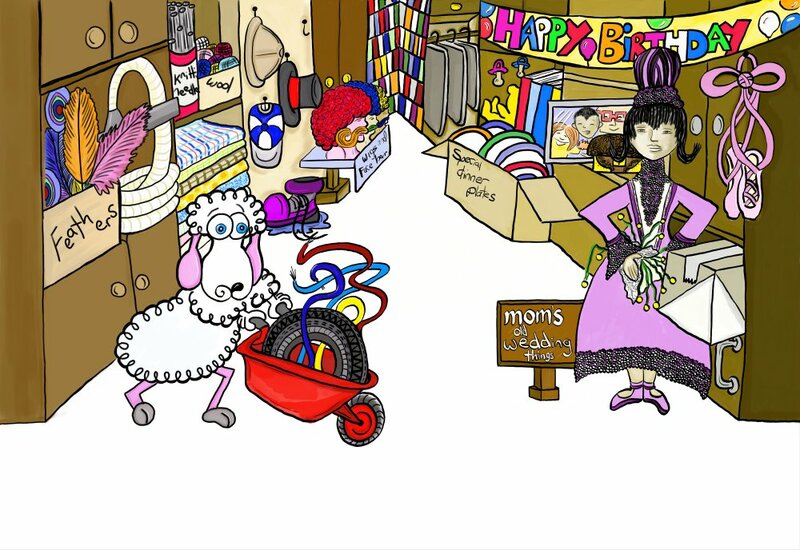 On the verge of giving up the goat finds it’s place in the world as a hair stylist to royalty in a nice boutique. A simple storyline about a greedy goat, BUT the illustrations paint a different picture. Yes, the goat eats flowers and hair, but he is wrongly accused of taking the button, Mom’s wedding things and most of the ensuing chaos. The goat is a patsy, a dupe, a scapegoat if you will, the real culprit is the family’s cunning sheep! A thought provoking story with a twist at the end that will appeal to parents and children (ages 4-8) who love read aloud rhyming picture books. This is a simultaneous submission, the full 461 word manuscript is below, with a link to example illustrations below the MS.
URL to private webpage just for agents. That Greedy Goat Just Cannot Stay! is one of five complete PB manuscripts by Marie and David Law. Although we are looking to build a long term career as an author/illustrator couple, we are flexible with how our manuscripts are published. We wouldn’t have a problem with other illustrators illustrating a project if a publisher is only interested in the manuscript text. Below are Marie’s example rough illustrations (from the webpage for agents), they are in different styles, we like the middle style best. The query is still a little long at the top, but if an agent submits the Greedy Goat manuscript to an acquisitions editor (to a children’s book publisher) the synopsis like introduction could be modified (by the agent) saving the agent time creating a pitch from scratch. As I write this article the query letter is untested and we might wait for the next finished manuscript. From what we understand it’s harder to sell a rhyming picture book (all our complete PB manuscripts are rhyming) because of the inherent difficulty in translating them to other languages. The greedy goat story doesn’t need to rhyme to be a good story, we think it would work in other languages without worrying too much about the rhyme. The number one rule of writing a good rhyming story is the story comes first. As we went through the process there were snippets of query letters we liked. Used some, but not all of them. This was for a query to Stephen Barr of Writers House: Steven Malk is also at Writers House. We used this in the query, thought it was funny. A family goat is accused of eating a button from a little girls coat and when he chews Dad’s new toupee, enough is enough, That Greedy Goat Just Cannot Stay! The family tries to find the goat a new home on a farm, at a petting zoo and in desperation even try a junk yard! Each time the goat eats things he shouldn’t and has to go. We are pitching a murder mystery picture book without the murder and not a lot of mystery. Starring a lost button, a greedy goat, a funky punk hairstyle and a mysterious sheep! 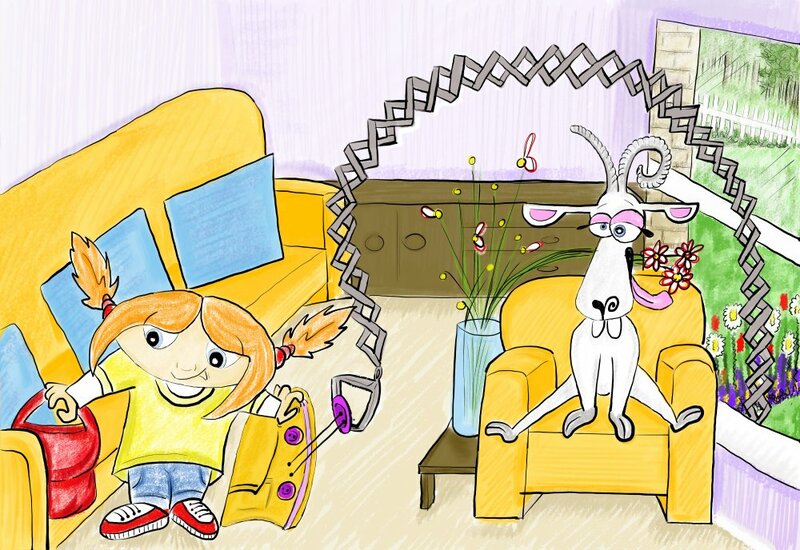 We present “That Greedy Goat Just Cannot Stay!” a 461 word picture book with a twist in the illustrations. We’ve all had one of those days, your greedy goat has knicked a button from your coat, ruined Mom’s cherished wedding things and of course munched on Dad’s new toupee. A typical Monday morning for most of us, but what if the greedy goat wasn’t the bad guy? What if he’s nothing more than a misunderstood artisan, and the real villain is your sheep! Families greedy goat or family’s greedy goat– first line. Thank you, thank you, thank you Brandon for catching this AND for taking the time to comment. I made the mistake three times in one query letter, I have a feeling had I sent it out the agents would have noticed! The Addison families (should be family’s) greedy goat has stolen a button from a coat, ruined Mom’s cherished wedding things and of course munched on Dad’s new toupee. Dad now looks like a funky punk and has had enough, That Greedy Goat Just Cannot Stay! Follow the families (should be family’s) hilarious adventure as they fail to re-home their greedy goat at a farm, petting zoo, old junk yard and a garden with a moat. On the verge of giving up the goat finds it’s place in the world as a hair stylist to royalty in a nice boutique. A simple storyline about a greedy goat, BUT the illustrations paint a different picture. Yes, the goat eats flowers and hair, but he is wrongly accused of taking the button, Mom’s wedding things and most of the ensuing chaos. The goat is a patsy, a dupe, a scapegoat if you will, the real culprit is the families (should be family’s) cunning sheep! Ghostbusters Reboot Looks Like Sexism Ain’t Dead!